What happens when you allow industry to police itself? Rarely does it lead to industry arresting itself, or even pulling itself over just to let itself off with a condescending warning. Sulfur dioxide, also known as SO2, is a toxic pollutant released by volcanoes, by burning coal, and other industrial activities. Volcanoes we can excuse for not accurately reporting their pollution emissions due to their lack of fingers to count on, but industry probably doesn't have the same excuse. 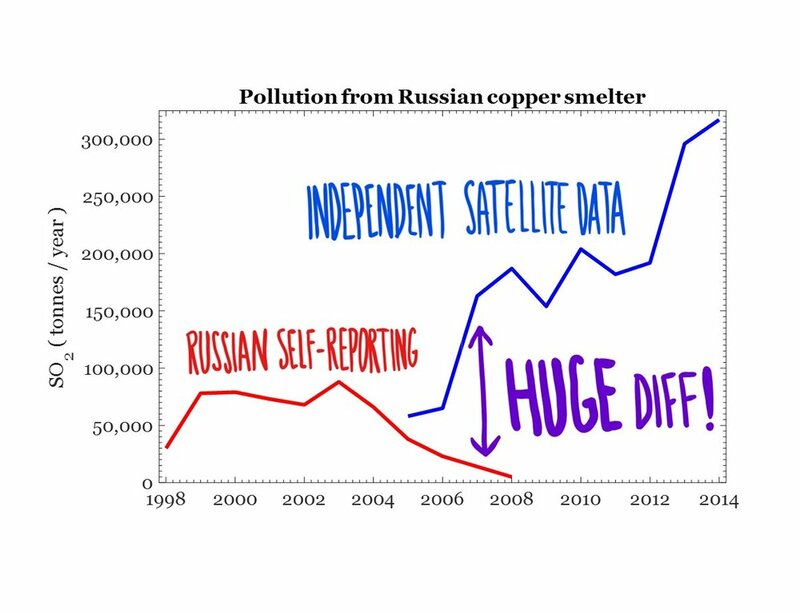 EXAMPLE: One of the top 20 largest sources of SO2 on the planet (excluding volcanoes) is a Russian copper smelter in Karabash. But the only reason why we know it is among the world's greatest polluters is because satellites can independently measure emissions from space. According to dubious Russian sources, the Karabash smelter installed output scrubbers sometime around 2001, which immediately reduced emissions of SO2. However, independent satellite data shows that no such reduction of emissions ever actually happened. In fact, between 2003 and 2014, above the Karabash smelter, concentrations of SO2 more than tripled. Great. But, what's the ultimate message here? Clearly, this is just one story: one Russian copper smelter gaming the system. It's extremely tempting to say, "See! Industry can't be trusted!" We've offered no other examples of this kind of behaviour. So, it comes down to whether you think corporations feel some kind of imperative to honestly report their pollution output. Our opinion: independent regulation could possibly, maybe, be a good thing. Hashtag: SAVE THE EPA!